The American Boat & Yacht Council has initiated a program whereby component manufacturers can have their products tested and certified to ABYC standards, entitling them to bear this logo in their promotions. Spanish-speaking applicants for the American Boat & Yacht Council’s Electrical Certification exam may now take it in their native language. The preparatory study guide is also available in Spanish. The move was championed by Ward Eshleman, president of Ward’s Marine Electric in Fort Lauderdale, Florida, as well as by Brunswick and MarineMax. Ward’s, along with staff from Bayliner Boats in Mexico, and Sasga Yachts in Spain, proofread the text of the guide and exam to ensure that the technical terminology was correctly translated. In announcing the offering, Ed Sherman, ABYC’s vice present of education, said, “Much of the techno-speak we take for granted created an unnecessary challenge for talented Hispanic students at exam time.” Learn more about the electrical certification program, as well others that include diesel and gasoline engines, corrosion, composites, and A/C refrigeration at www.abycinc.org/education. In another announcement, ABYC says it has partnered with IMCI (International Marine Certification Institute) to administer a certification program for boat “components”—that is, products we all use to build, operate, and maintain boats. ABYC’s technical vice president, Craig Scholten, says, “This program applies to marine components that can be purchased and installed by builders, dealers, repair yards, and consumers and will help with confusion where buyers wade through a sea of products that appear to be for marine use, but may actually be designed for automotive or RV use. The ABYC Certified Component logo establishes that the product is built specifically for marine applications. Additionally, knowing that certified components have been tested and comply with the applicable standards helps builders minimize costly redesign and recall issues.” The program does not cover raw materials such as reinforcements, resins, and coatings. Here’s how it works: Component manufacturers can either have their product tested by an IMCI-approved laboratory, or conduct in-house testing according to protocols established by an IMCI-approved laboratory. 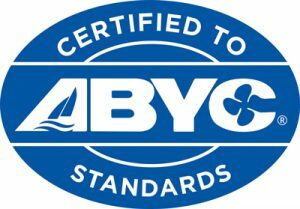 If successful, manufacturers can claim their product has been “Certified to ABYC Standards,” and use the relevant logo in their promotions. This may also apply to the International Organization for Standardization (ISO). Application forms are available at www.imci.org/66.